I've been wanting to make it out to the Rockaways for a while and a recent day off (on my birthday no less) gave me that opportunity. Dan and I started the day with an awesome surf lesson at the Locals Surf School on Beach 67th Street, which was a lot of fun and we were pleasantly surprised by our decent surf skills. Unsurprisingly, all this activity made us super hungry, so we headed to the popular beach area between Beach 86th and 96th streets for some food and drink. After properly exploring both concession areas, we found the food offering to be a lot richer on Beach 96th Street, especially at the Bolivian Llama Party stand. 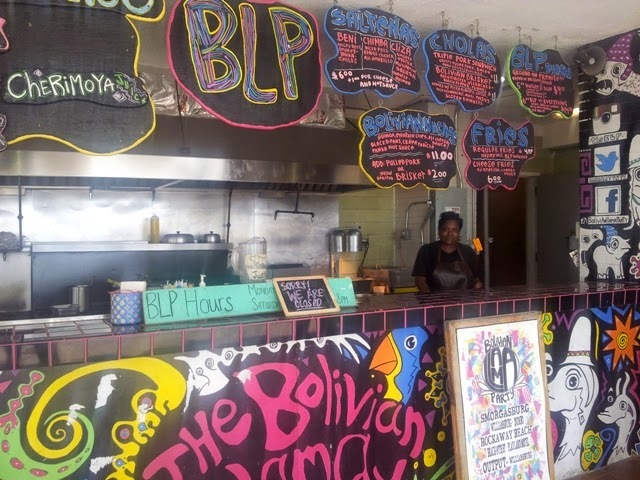 Started by the Oropeza brothers with the mission to "create a unique food experience...to deliver Bolivian comfort food with a few veritable bells and whistles," Llama offers something new and interesting to the street food scene but in a familiar friendly setting. Located at Beach 96th Street, they have a pretty prominent presence seven days a week, but you can also find them at the nearby Playland Motel and also at Smorgasburg. Dan and I marveled at their colorful stand that's adorned with fun street art, including birds and (what do you know) llamas. They open at about noon on most days, and change up their menu according to the latest, fresh ingredients. Very interested in their BBQ dishes, Dan and I both went for the meat sandwiches which were embellished with fixins such as pickled onions, carrots and a slightly spicy green sauce. 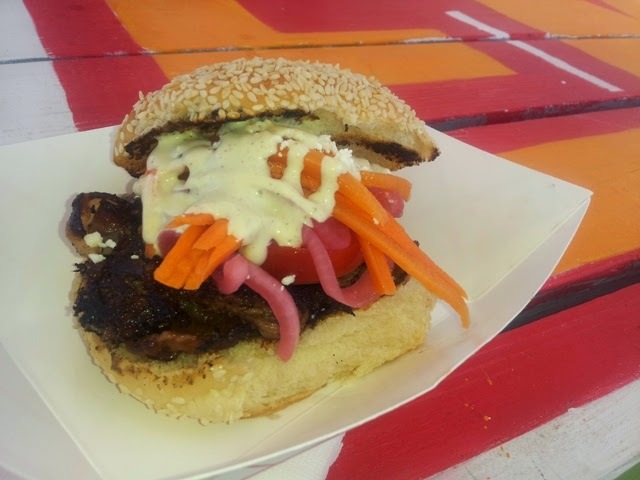 Beef Brisket Chola - While this sandwich didn't look big, it was stacked high with hearty, delicious ingredients. The brisket was smoked to perfection and sported a nicely charred exterior. Rubbed with spicy ingredients such as locoto (type of chili pepper) and cracked peppercorns, the sandwich sang with flavor. Luckily, the spice wasn't overpowering, as the pickled veggies such as the carrots and the onions dulled the heat. Pulled Pork Chola - Just like the brisket, the pulled pork was also a winner and didn't look too much different. Pulled from a beautifully marbled cut of pork shoulder, it had hints of sweetness and spice--also perfectly moist, no doubt due to the marbling. I have to admit that the service was a tad awkward, as the staff didn't 100% know everything about the menu. Since a lot of the terms on their menu cards were unfamiliar to us, we asked a lot of questions that were met with blank stares. Not a deal breaker, but it made for an odd experience. Costs are high for street food at about $11 for a small sandwich, but the flavors were so interesting and tasty that I can confidently say it's worth it.